Attero Tech is now shipping the latest addition to the Synapse family of networked audio rackmount interfaces – the Synapse DM1. The DM1 is a networked audio monitor for confidence monitoring of networked audio and local sources at the rack. Audio monitoring is provided via front panel headphone connectivity or through the integrated speakers on the front of the device. The DM1 includes two modes of network audio monitoring: Standard and Extended. The standard mode features monitoring of any of the 32 channels assigned to the Dante/AES67 receiver inputs. Extended mode allows subscription-based monitoring of up to 128 channels (Dante-only) loaded to the DM1 using the unIFY Control Panel Software. In both modes, audio may be selected for monitoring by the user via the front panel controls. The DM1 also features AES-3 digital outputs for connectivity to full range powered speakers or amplifiers and two channels of analogue I/O for local source monitoring and network connectivity. Additionally, the DM1 provides two integrated SFP ports for fibre expansion where long-haul audio is needed, a primary and secondary Ethernet port for network redundancy, and an integrated power supply with optional external supply for applications requiring redundant power capabilities. The Synapse DM1 is now supported by the latest release of Attero Tech’s unIFY Control Panel software (v3.2.1) and is shipping worldwide. Please visit https://www.atterotech.com/products/dante-aes67-rack-mounts/synapse-dm1 for more product and application information. 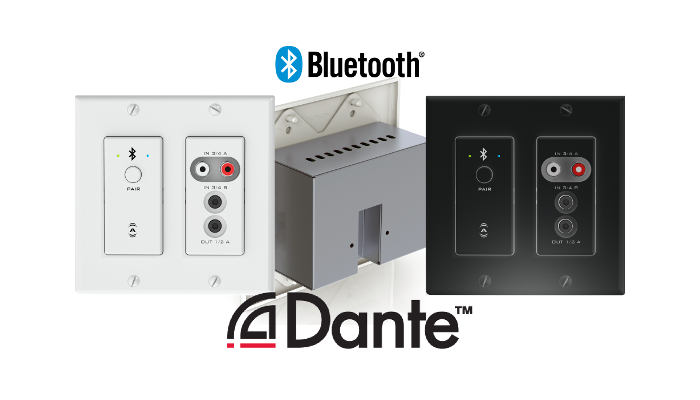 Attero Tech, a leading manufacturer of networked AV connectivity solutions, has released a major firmware update for its unD6IO-BT Dante-networked 4×2 audio wall plate with integrated Bluetooth audio receiver. The new firmware introduces several important new features. In addition to a standard A2DP Bluetooth streaming media connection, the unD6IO-BT now offers a Bluetooth Call Bridging mode for bridging cell phone audio into a Dante audio system via Bluetooth. With this feature, for example, an off-site team member can join a conference by calling a local team member’s cell phone, which routes the call to the network via the unD6IO-BT’s Bluetooth receiver. One advantage of the Attero Tech Bluetooth audio plates is the intentional limiting of Bluetooth reconnections. This precludes previous users from automatically reconnecting in public or sensitive spaces, where multiple users may stream audio over Bluetooth. However, automatic reconnection may be desirable in some applications, such as residences and private offices, so the unD6IO-BT now enables flexible pairing/connect options. In Default mode, users must press the Pair button every time they want to connect, as in the past. The new Reconnect mode permits a previously paired device to automatically reconnect when in range of the unD6IO-BT. In the new Exclusive Connect mode, only one exclusively paired device will be permitted to automatically reconnect when in range of the unD6IO-BT, enabling restricted or personal use. With this update, the unD6IO-BT supports Audio Video Remote Control Protocol (AVRCP) pass-through for source control of a connected Bluetooth audio media device. The unD6IO-BT can “bridge” supported transport control commands over the network so that a connected device can be operated remotely, without the user needing to be at the device. For example, a user could leave a cell phone charging in one room and remote-control music streaming from the phone using an AV system control panel located elsewhere in the facility. Supported commands include Play, Pause, Stop, Next Track, Previous Track, Volume Up, Volume Down, and Mute. 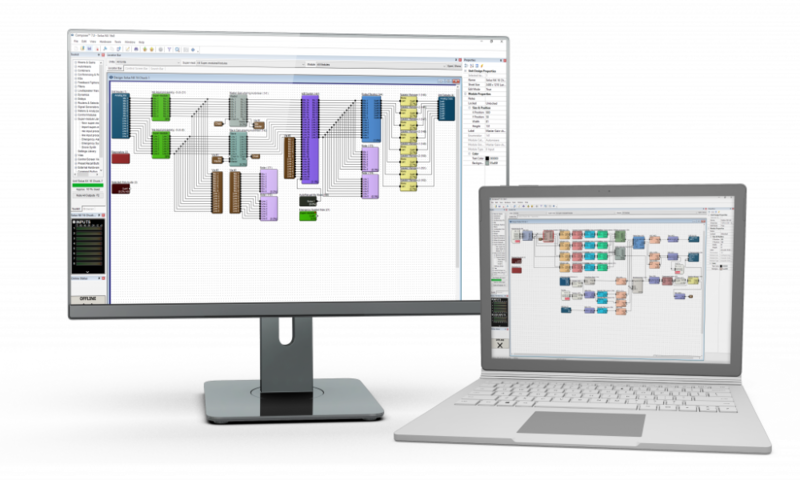 In addition, the unD6IO-BT plug-ins for unIFY Control Panel (UCP) and Q-SYS Designer have been updated to include integrator options for real-time media transport control and monitoring of the connected device metadata (artist/album/song/device name). The device plug-in has also been updated to support DDM compatibility. Symetrix has announced the Radius NX 4×4 and Radius NX 12×8 1U rack-mount audio signal processors. Each model supports 128 (64×64) channels of redundant Dante network audio. 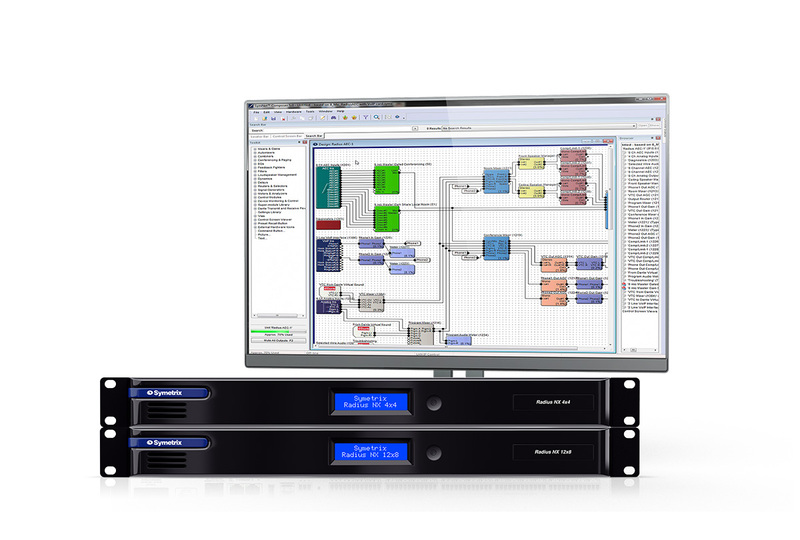 The two Radius NX processors are programmed using Symetrix’ Composer software for Windows, offering identical DSP resources provided by a next-generation SHARC dual-core processor that places the burden of large matrices in one core, while freeing the second core for general-purpose signal processing. This makes it possible to design very large and complex systems around a single Radius NX. A configurable, 4-port gigabit switch serves both the Dante and control networks. This reduces or eliminates the need for external switches and prevents 100 megabit bottlenecks. Each Radius NX model offers two 1000 Base-T Dante ports, two 1000 Base-T Ethernet ports for Symetrix Composer host control and third-party accessory control over IP, an RS-232 serial port for third-party accessory control, and an ARC port that distributes power and RS-485 data to one or more Symetrix ARC devices. A USB audio I/O port interfaces with soft codecs or recording and playback software on Windows, Mac, and Linux platforms. The USB adio port can be configured for up to 8×8 line I/O, 2×2 line I/O, 1×1 speakerphone, or 1×1 echo cancelling speakerphone profiles. Both Radius NX models feature a card slot that supports all currently available, optional Radius and Edge I/O expansion cards, including VoIP, ATI, and USB cards. Either Radius NX also can connect directly to a complete lineup of software-controlled, Dante-enabled, analog I/O expanders to add larger numbers of analog inputs and outputs. An optional AEC co-processor, available in single-core or dual-core versions, enables up to 16 channels of wide-band acoustic echo cancelling for clarity and intelligibility in AV and distance learning applications. Each core corresponds to a single AEC module in Composer, providing up to eight channels with a single reference or up to four channels with independent references for each channel. Radius NX Composer AEC modules are fully virtualized-AEC can be applied to any source and routed to any destination. Radius NX supports a virtualised and scalable AEC co-processor module, providing up to 16 full bandwidth AEC channels. Headquartered in Lagos, Nigeria, manufacturing company Mouka Limited has built a leading position on the country’s household and industrial markets since its founding in 1959. With 800 employees and production facilities in Lagos, Benin and Kaduna, Mouka is now Nigeria’s foremost supplier of branded mattresses and foam-based products for sleep solutions. Products such as foam blocks, beddings and duvets, and polyurethane blocks are widely available throughout retail and wholesale channels in Nigeria. Due to the highly flammable nature of foam and polyurethane materials, fire safety at manufacturing facilities is a prime concern. However, when Mouka Limited was looking for a solution that detects fire and smoke in less than 30 seconds – before fire can spread and potentially harm employees – the market had nothing to offer. The reason: Common point-type detectors, detecting smoke particles in the air, rely on smoke particles to rise, which can take several minutes – especially when detectors are mounted on high warehouse ceilings. Fortunately, Bosch offers an innovative product sensitive enough: AVIOTEC, a VdS-certified solution for visual fire monitoring detecting smoke and flames at the source, which is much faster than common point-type detectors. Software inside each device analyzes the video images for visual patterns associated with fires like specific motion and shape characteristics or colour changes. When connected to IP-based video management solutions the video images provide additional information, e.g. for alarm verification or localization of the fire. AVIOTEC was much closer to the insurance’s requirements than any other solution on the market. Working closely with the teams at the three Mouka Limited factories in Lagos, Benin and Kaduna, Bosch provided 34 AVIOTEC devices for video-based fire detection, alarm sounders, strobes and a third-party sprinkler system, all connected to a Bosch addressable Fire Panel 1200 Series. With its ability to detect flame and smoke at a very early stage, the Bosch video-based fire detection system is a real asset at all three facilities. First, it significantly raises the safety of hundreds of employees at Mouka Limited factories. Second, it shortens alarm response times and thereby minimizes the risk of potential damage to equipment and product inventories. And third, analysis of video images of a fire allows for root cause analysis after an incident. 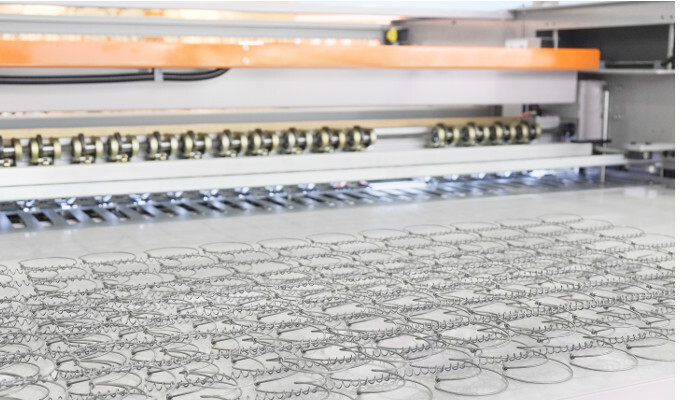 In addition, the fact that the system offers fire detection at industry-leading speeds has been appreciated by the insurance provider responsible for setting the insurance premium for Mouka Limited’s facilities. Meanwhile, word about the new state of the art in early fire detection at industrial manufacturing sites is spreading throughout Nigeria – and beyond. When the San Jose McEnery Convention Centre needed a new lighting system that could support the multi-use, high-production-value conventions their clients expect, they turned to ETC. Now they have a lighting system as advanced as the industry around them. “The previous sodium light fixtures were from the ‘80s,” says Gabriel Nemeth, director of event operations. “Advances in technology and changing client demands put us behind the times.” This was particularly true for trade shows that demand a space that serves multiple functions, with some sections being used for keynotes and others for trade show booths. Clients would ask for dimmed lights over the keynote area and bright light in the tradeshow sections – something the old system couldn’t do, costing the client more money to get the effect they wanted. The sodium fixtures were also unflattering. “It felt like you were in an old warehouse or a big box store,” says Tim Foster, director of production at Team San Jose. Foster, Nemeth, and their team wanted the cooler, bluer colour temperature lighting of 4000K to give the space the feel of natural sunlight. Finally, whatever new system they adapted had to work on 277V power, so the convention centre wouldn’t have to install an expensive transformer. 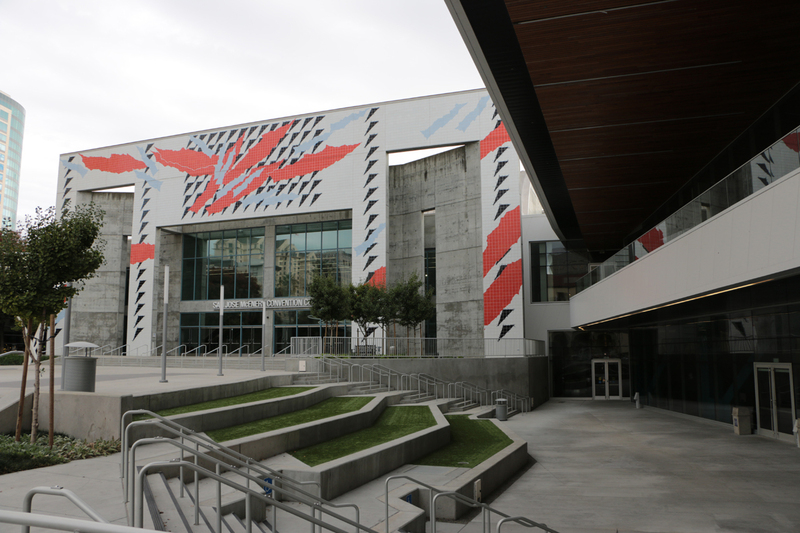 With their needs outlined, Team San Jose Chief Operating Officer Dave Costain entrusted General Manager of Convention Center Operations Ewell Steiner, Nemeth and Foster to make it happen. Team San Jose also credited the help of San Jose Public Works Senior Engineer Tony Andary and Associate Engineer Huimin Mu for allowing the whole renovation to meet a very tight timeline. The end result wasn’t just user-friendly, it was user ecstatic. “Every lighting designer who’s come in here in and tied into the system has told me this is one of the coolest buildings they’ve ever been in,” says Foster. Lighting designers love the ability to control individual fixtures, whether for large sections of the hall like a keynote, or to dim the house lights above a booth to highlight the special lighting for one particular client. Designers aren’t the only ones who are happy. Accountants love not having to pay for extra equipment or more set up time. “Clients tell us they’re seeing cost savings on everything from equipment rental to trucking and labour because they don’t have to bring in additional gear. All of those costs are gone, and the savings are showing up,” adds Foster. The Geneva International Motor Show attracts more than 700,000 visitors every year and hosts the largest and most renowned car manufacturers from around the globe. It is one of the world’s three most prestigious and influential car shows, alongside the Detroit Auto Show and the IAA in Frankfurt. This year in Geneva, Source Four fixtures from ETC were among the luminaires selected to highlight the new models unveiled by premium car manufacturers Mercedes-Benz and Audi. The task of lighting automotive shows can be a challenging one, with some naming them among the most demanding lighting design projects. Lighting plays a crucial role in such events – brands want to draw attention to their displays with precise illumination, without skewing the appearance of the colour finishes of the vehicles. Consequently, only the best systems on the market are selected to showcase the major car brands’ latest and greatest creations. 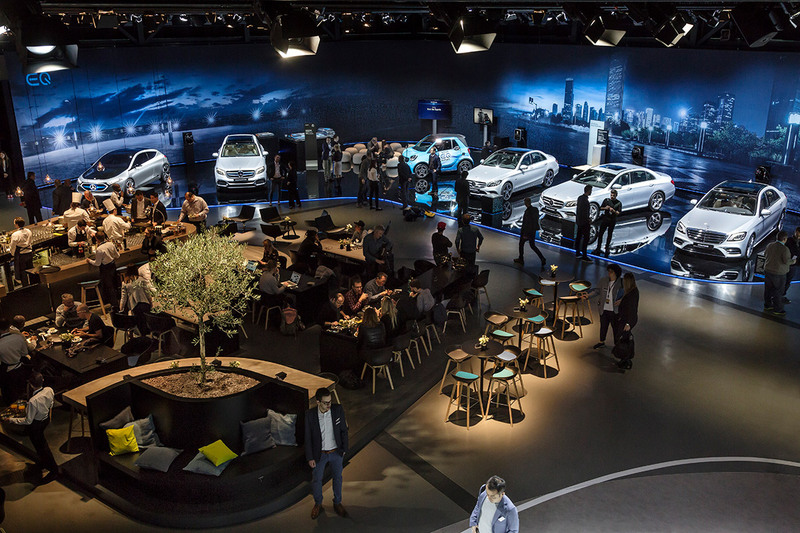 For the 2018 edition of the Geneva Motor Show, German-based company rgb GmbH was entrusted to supply bespoke lighting solutions for the exhibition spaces of Audi and Mercedes-Benz. In order to perfectly illuminate global premieres from Mercedes-Benz – including the all-new Mercedes-AMG GT 4-Door Coupé and the extensively redesigned C-Class –the rgb team specified only the highest quality luminaires. Among the fixtures selected were 141 Source Four PAR 750, 43 Source Four Profile 750 and three Source Four LED Series 2 Daylight HD from ETC. Meanwhile, an exclusive press event for Mercedes-Benz called for an additional 49 Source Four LED Series 2 Daylight HD fixtures, a further 25 Source Four PAR 750 and 28 Source Four PAR 575. Additionally, almost 140 ETC fixtures were positioned to complement the Audi exhibition area, including 54 Source Four Profile 750 and 53 Source Four LED Series 2 Daylight HD luminaires.